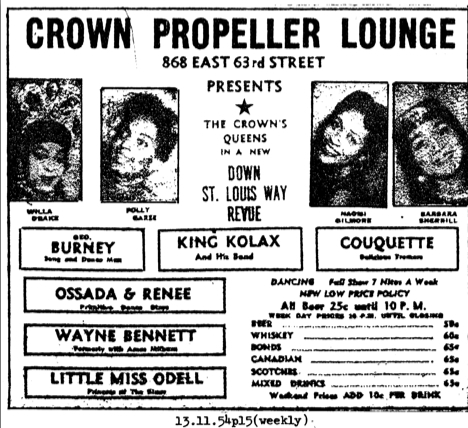 at the Crown Propeller Lounge in Chicago, exact date unknown. 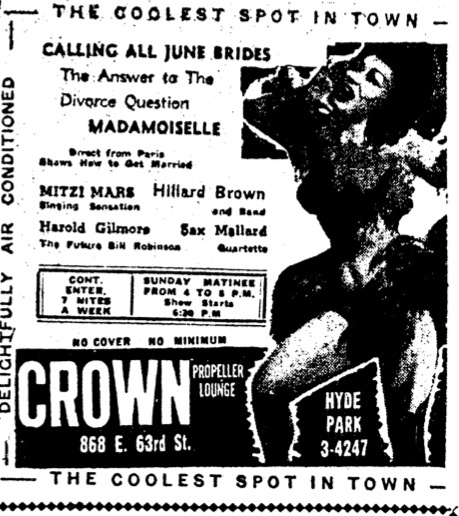 Already more than a half a year ago I was informed that Mildred “Mitzi” Schlossberg, co-owner of Chicago’s Crown Propeller Lounge (after which this blog here is named) passed at the proud age of 100. What an interesting life she must have had! I wanted to put up something here at that time, but I have been extremely busy otherwise during the last months. 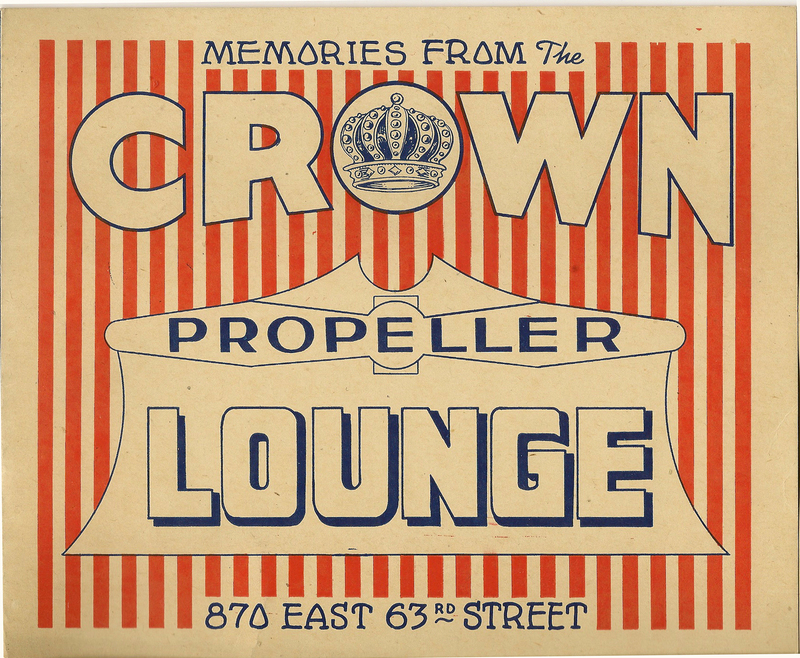 But all the while I have been on the lookout for souvenirs from the Crown Propeller Lounge and I managed to acquire two very nice items. 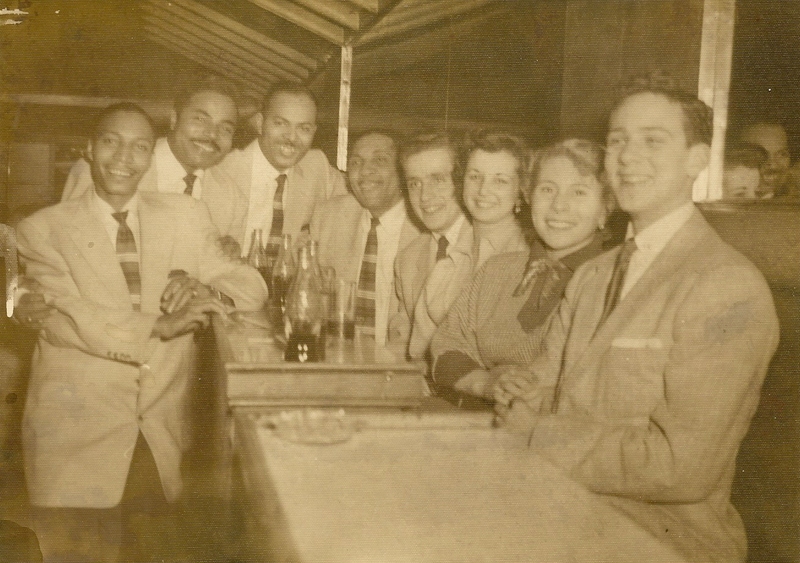 The first is a photograph showing Mitzi Schlossberg’s husband Norman Schlossberg with a woman and three men. 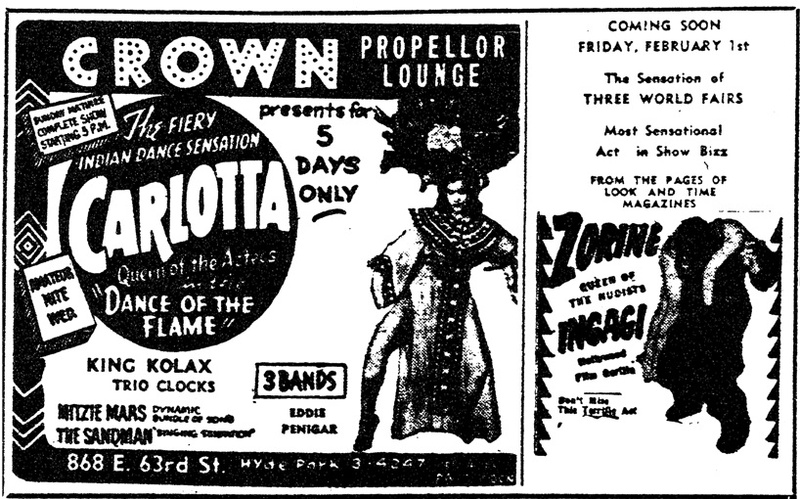 It comes from Mitzi Schlossberg’s estate, and I found it on ebay. The three men are holding trophies in their hand, but unfortunately the writing on the cups is out of focus. 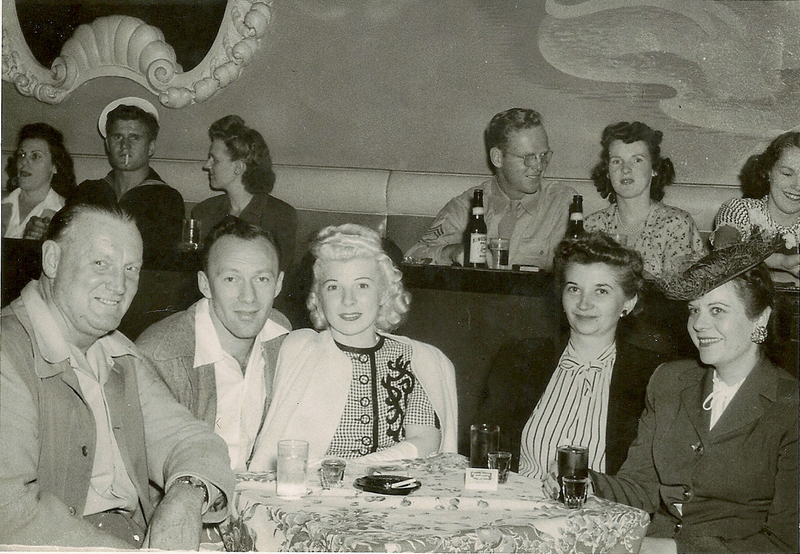 left) with unidentified others on October 15, 1953. 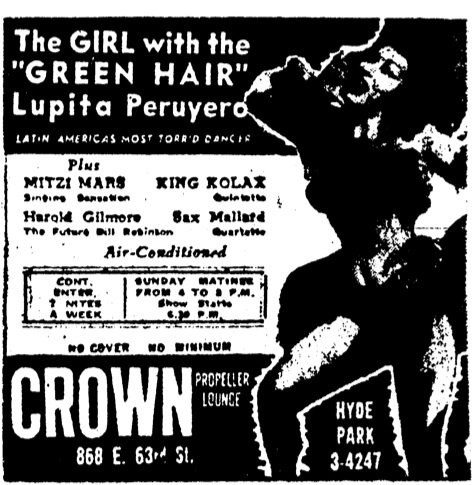 The backside of the photograph is stamped Oct. 15, 1953. (Photographer was H.S. 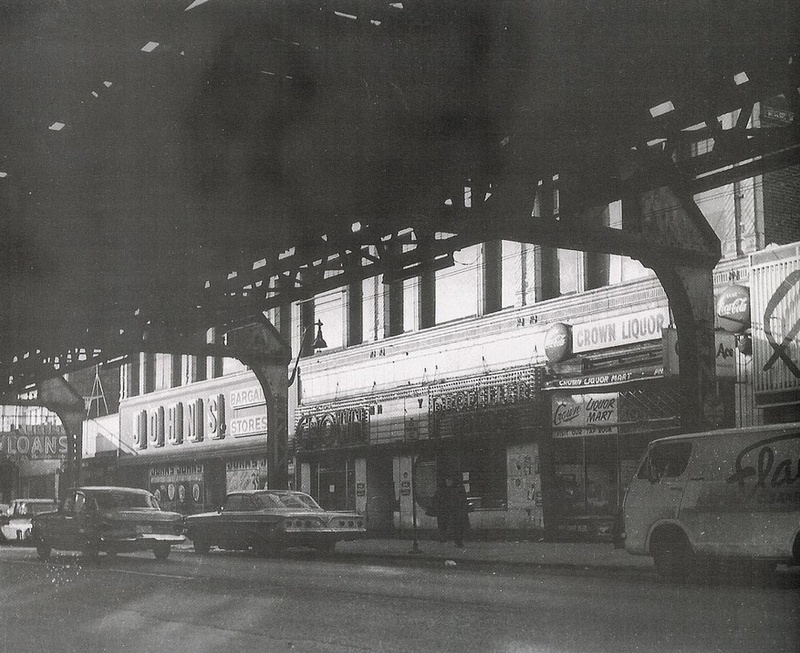 Rhoden, 7037 Indiana Ave – if you care). 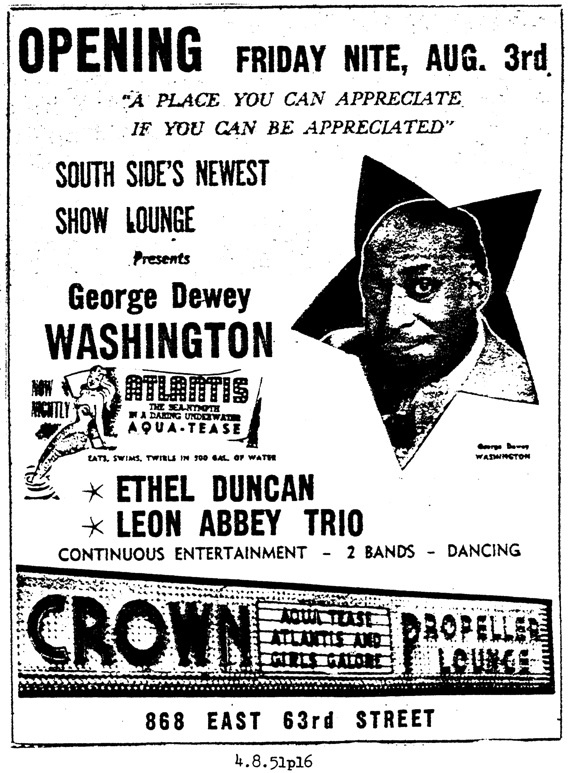 October 15, 1953 was a thursday and I found an ad in the “Chicago Defender” for that day. 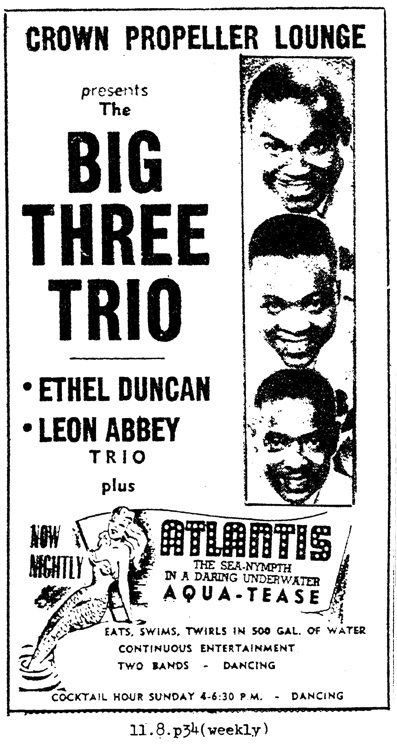 From Chicago Defender, Defender, Oct. 10 1953. 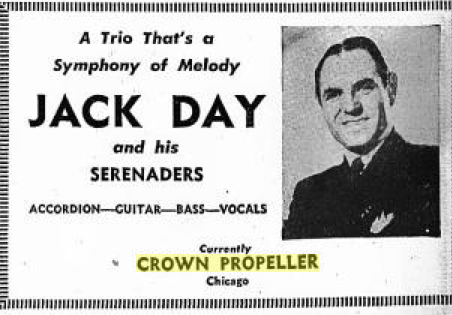 But unfortunately the ad does not give out a hint what the trophies were for. 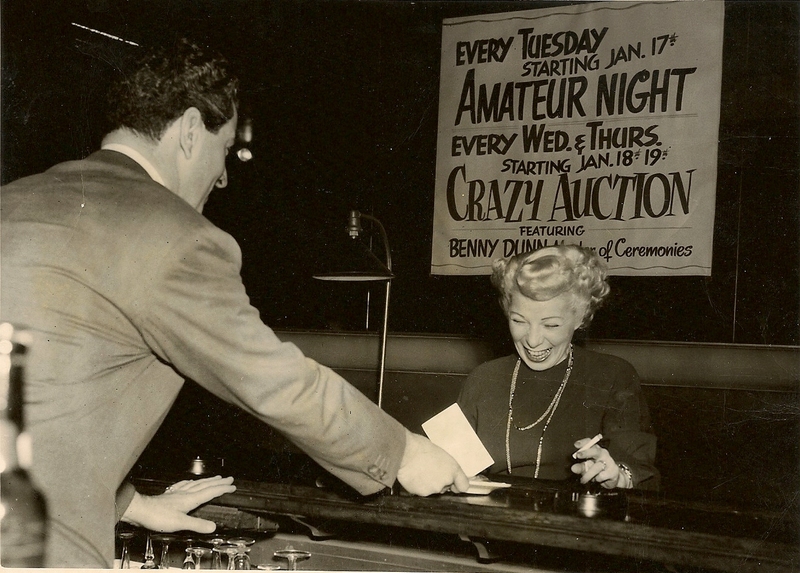 There is a small possibility that the photo was taken during the night between the 14th and the 15th and come from Wednesday night’s regular talent contest at the Lounge – but the prices for winning the “Talent Nite” are given as $25 (1st) and $10 (2nd). Would they be handing out trophies as well? 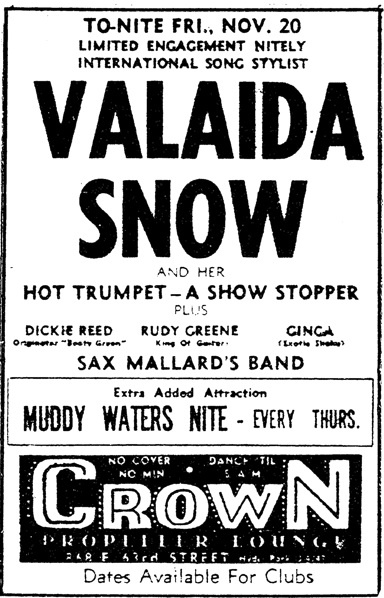 In a recording from October 14, 1949 (for Decca), it is trumpeter Tiny Davis’ All Girl Band with Tiny herself (tp,vcl), Birdie Davis (as), Helen Cole (p) and unknown ts, p and b playing “Race Horse”, a nice Boogie Shuffle. 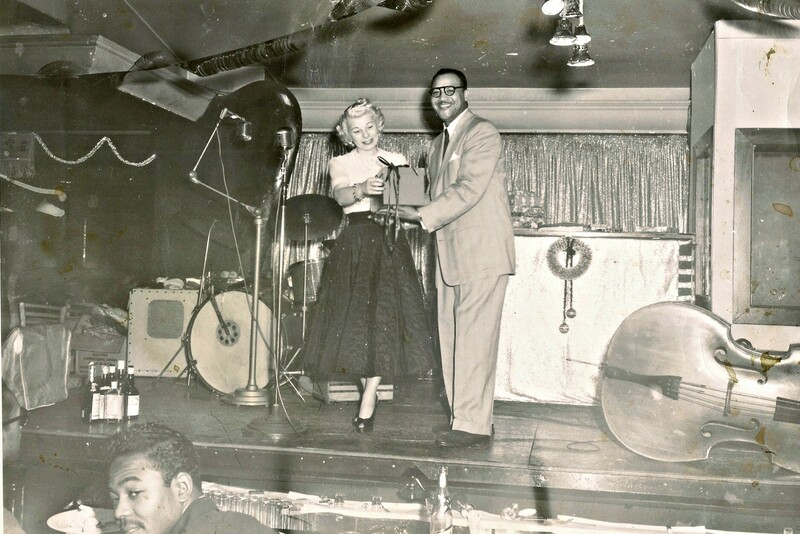 And here is guitarist Rudy Greene playing “Meet Me Baby”, recorded with King Kolax’ band for Chance Records in 1953. The other nice item I could lay my hands on is one of the typical souvenir pictures made by house photographers in different clubs in Chicago. 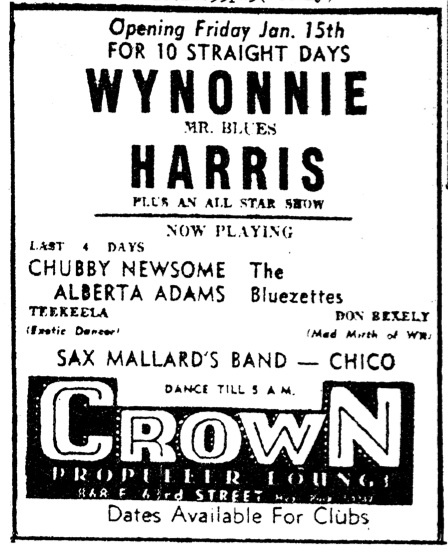 I imagine they were quickly developed in some small dark room in the club and then sold to the photographed customers. Here we have a couple of people at a table – apparently not all of them enjoying the proceedings. 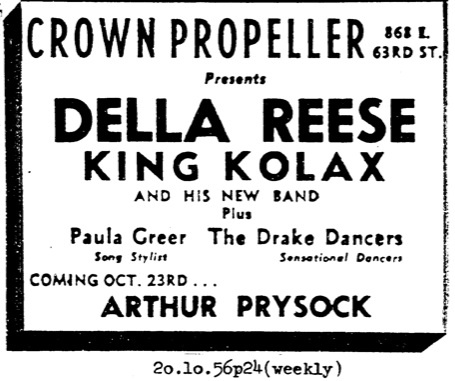 A pointer to the date this photo was taken is the Crown Propeller sleeve in which it came (above). 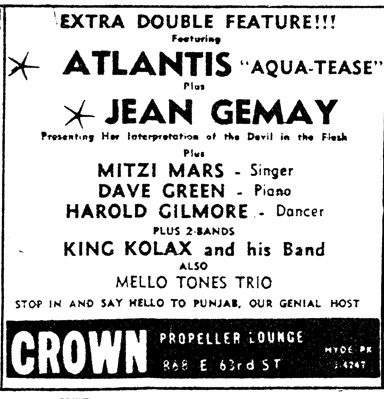 Sax Mallard as well as violinist Leon Abbey were part of the Crown Propeller’s program together only in September 1951. It is strange though, that they printed an extra sleeve just for these few weeks. 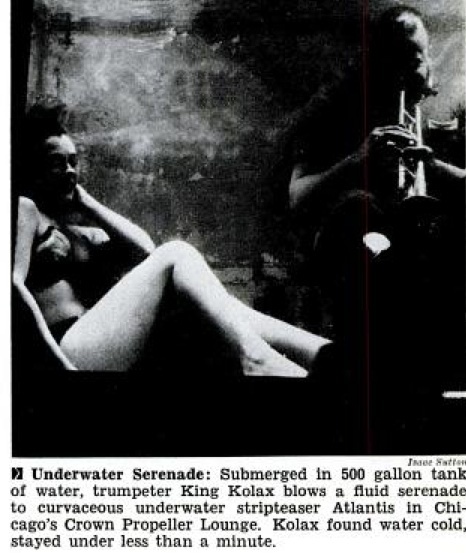 How about some music to this photograph? 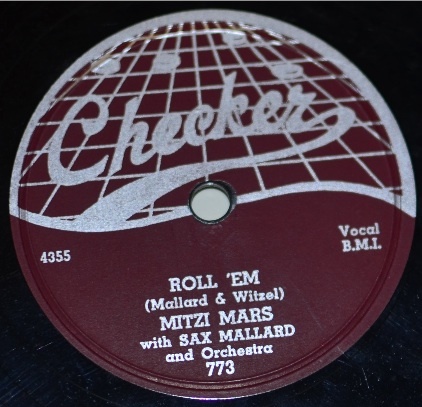 I can not offer you anything by Leon Abbey or by the Ding Bell Trio, but here is a video that lets you listen to Sax Mallard’s “Teen Town Strut!”, recorded for Checker on May 12, 1952. 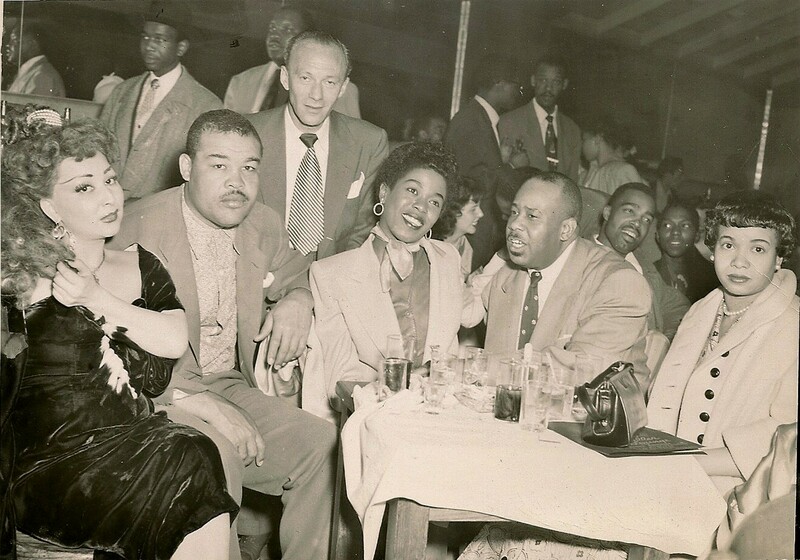 With Sax Mallard (ts); unidentified (tp); unidentified (ts, bars); William “Lefty” Bates (eg); probably Jimmy Bowman (p); probably LeRoy Jackson (b); probably Sleepy Nelson (d).